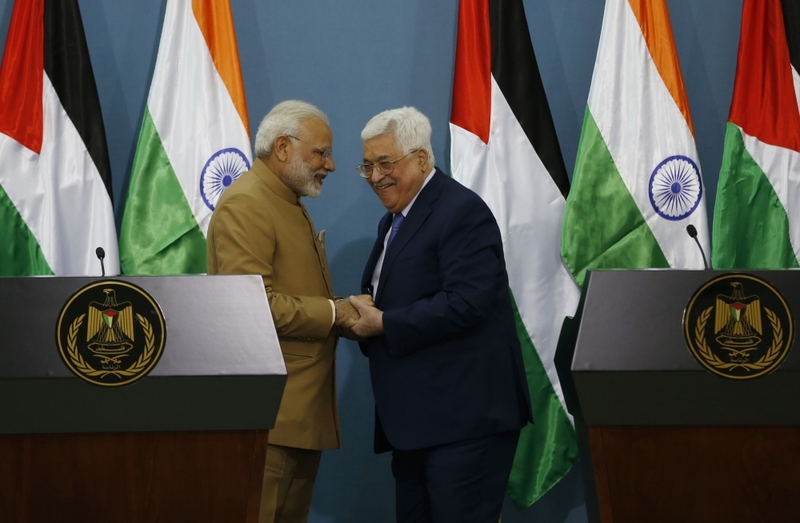 RAMALLAH, West Bank — Palestinian President Mahmoud Abbas told visiting Indian Prime Minister Narendra Modi on Saturday that he is counting on India’s support for a multi-country sponsorship of any future Israeli-Palestinian negotiations. Such a framework would ostensibly replace Washington’s long-standing monopoly as mediator. Abbas rejected the traditional US role after President Donald Trump recognized contested Jerusalem as Israel’s capital in December. Trump’s pivot upset Palestinians who seek the city’s Israeli-annexed eastern sector as a capital. Abbas has appealed to the international community, including countries in Europe and the Arab world, to demand a say in future negotiations, but has so far failed to secure commitments. European leaders have criticized Trump’s dramatic policy shift on Jerusalem, but appear unwilling to confront Washington over its handling of more than two decades of failed efforts to broker an Israeli-Palestinian partition deal. Modi’s visit to the city of Ramallah was the first by an Indian prime minister to an autonomous Palestinian enclave in the Israeli-occupied West Bank. The Indian leader pledged $41 million for a hospital, three schools and other projects in the West Bank. He said India remains “committed to Palestinian national rights,” but stopped short of offering support for Abbas’ political agenda. Modi’s West Bank visit was seen, in part, as an attempt to compensate the Palestinians after he hosted Israeli Prime Minister Benjamin Netanyahu for six days last month, in a reflection of warming ties between Israel and India. Modi flew to Ramallah from Jordan by helicopter on Saturday and laid a wreath at the grave of Abbas predecessor Yasser Arafat, located in Abbas’ walled government compound. Modi then toured the Arafat museum, which is also part of the compound, before holding talks with Abbas. Abbas said after their meeting that he remains committed to negotiations with Israel as the path toward Palestinian independence. Palestinians seek a state in the West Bank, Gaza Strip and east Jerusalem, lands Israel captured in 1967, but no meaningful talks on statehood through a partition deal have been held for almost a decade. “Here we count on India, with its status as a great power, its historical role in the non-aligned movement and in international forums ... to achieve a just peace,” Abbas said. Israel staunchly opposes any international framework for negotiations, arguing that only the US can be a fair broker. The Palestinians have criticized Trump’s shift on Jerusalem as a sign of blatant pro-Israel bias by Washington. Modi told Abbas that “support for the Palestinian cause has been one of the mainstays of our foreign policy” and that he hopes a Palestinian state will be established through peaceful means. The Indian leader headed to the United Arab Emirates after his West Bank visit. Abbas is scheduled to meet Monday with Russian President Vladimir Putin in Russia’s Black Sea town of Sochi.